Participants—28 mentors and 116 students—engage in the Department of Environmental and Occupational Health's 10th annual Speed Mentoring event on Nov. 15, during which professionals working in the field help guide current CSUN students on possible career paths after graduation. Photos by Lee Choo. Studying for a degree in college is a lot like finding that perfect someone. You have a lot of dates (classes), have ups and downs throughout the relationship (your collegiate career), maybe try another discipline (a new mate), all before you finish your dalliance and finally graduate (tie the knot). Don’t agree? Tell that to the Department of Environmental and Occupational Health at CSUN. 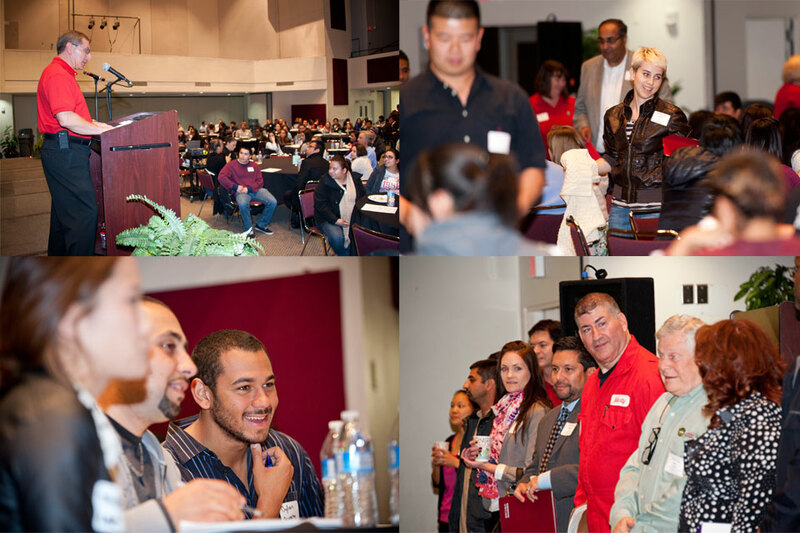 The EOH put on its 10th annual speed dating-esque Speed Mentoring event on Nov. 15, bringing professionals working in the field to CSUN to help guide current students on life after graduation. The event is held every year in the United Student Union, and it always has a great turnout of mentors and mentees. This time around was no different, with 28 mentors and 116 students ready to pick their brains. For those unfamiliar with the concept, the mentors hop from table to table, talking to 7 or 8 students about their jobs. What those jobs are varies greatly when you’re working in one of the EOH’s many career paths. Jobs that fall under the Environmental and Occupational Health umbrella are based in science. They deal with making work areas safe, be it from radiation or chemicals, bad ergonomics at someone’s workstation, or for the public doing food inspections. It’s a fascinating field, one that Bob Finklestein ’78 (EOH) stumbled upon, and has become an advocate for. He is now the President of the CSUN EOH Alumni Chapter, and has been participating in the Speed Mentoring event for the past nine years. “When I got into the field, I didn’t even know industrial hygiene existed,” Finklestein recalled. “And because of interning and talking to folks, I found out about it, and it ended up being a great career for me. I just found it by accident, so to speak.” He notes that every year, students from all disciplines like biology and chemistry come to the event to see what it has to offer. Many times, those students end up enrolling in the EOH program, which currently has 242 students and graduated 88 in 2011 (24 masters-level and 64 undergraduate). As one of the leading EOH universities in America, CSUN brings a lot of those graduates back to the Speed Mentoring event to help out. Former students Jennifer Saba ’10 (EOH) and Milton Guerrero ’09 (EOH) know that they got a lot out of talking to professionals and knew they wanted to come back to reciprocate. That message is clear to the likes of senior Hasmik Jasmine Hakobyan. She’s been part of the EOH program since she arrived at CSUN, and has loved each of the three Speed Mentoring events she’s been to. She particularly loves the intimate setting where she can get an idea of what she should expect in the outside world, especially when it comes from a fellow Matador.